Our Congressional Fellows and Presidential Management Fellows Training is designed to supplement and complement the Fellowship programs of federal agencies, the military, and other organizations. This training supports the education goals of Fellows sponsors who want their Fellows to understand and participate in various aspects of the legislative process. 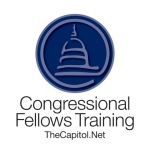 Our Congressional Fellows and Presidential Management Fellows Training is designed for cohorts of 15 to 25 Fellows who complete the training program together, and incorporates our previous certifcate programs in congressional operations and communication and advocacy. Fellows enrolled in the program complete six (6) required courses equaling 10 days of courses. Though course sequencing is not required, we recommend that courses be sequenced in the order listed below. Upon completion of the Fellows Training program, we award a framed Certificate of Completion and issue a press release to the media for each Fellow. The program fee of $97,500 covers one cohort of up to 25 Fellows ($3900 per Fellow for a cohort of 25 Fellows). The complete Fellows Training program must be completed by all Fellows in the cohort within a 12 month period. (Each transfer to a different cohort requires an administrative fee. No substitutions.) The program fee includes six (6) courses totaling 10 course days, classroom space in Washington, DC, all course materials, breaks, and five separate (5) luncheon meetings for one cohort in a 12-month period. Our Fellows Training includes six (6) courses (totaling 10 course-days) and five (5) luncheon meetings in a 12-month period. All six (6) courses and luncheon meetings are taken as a group within the cohort's 12-month period. We will arrange with the point of contact all dates for the cohort. If you have questions, please contact our Vice President of Training: 202-678-1600 ext. 115, or complete our online form. For a partial listing of Fellowships and Internships in Washington, DC, see this page on Hobnob Blog. Many Congressional and Legislative Fellows complement and enhance their fellowship with our Certificate in Congressional Operations, and the courses in our Congressional Fellows Training can be used to satisfy some of the Certificate requirements. "TheCapitol.Net's Certificate program in Congressional Operations was a first class learning experience that provided direct access to a wide range of highly regarded lecturers and speakers." "The program provided significant insights and guidance about how Congress works and how to work with Congress." "This coursework has improved my job performance immensely by connecting textbook knowledge of congressional operations with real-world experience." "TheCapitol.Net certificate program has been invaluable to my job as a legislative liaison. Each class improved my understanding of the legislative process and had a direct impact on my ability to advise the NNSA leadership on Congressional matters. The program provided me a real behind-the-scenes look at how decisions are made on Capitol Hill and how I can effectively shape those decisions to further the NNSA's mission." See more testimonials about our Certificate Programs.